In the early time, agricultural information exchange has been dominated by industrial media such as newspapers, radios, television, and magazines. Over the time period due to scientific and technological developments in recent years, however, technology awareness and computer literacy are increasing across all demographics and various forms of social media are being used more and more by people looking for news, education, and other information related to agriculture. There is not an industry or area of the world that social media has not touched. Even in rural areas, social media is reaching farmers and agriculture students. Both the old and the young are finding ways to connect. The internet, smartphones, tablets and the related apps and social media experience are evolving as a major extension tool for the present and future. New channels are developing to obtain information and market agricultural products, but what does this all really mean? Social media is all about people and can be defined as internet based applications that allow the creation and exchange of user-generated content. It is a way to build relationships, share information, and connect with diverse audience of people you may never meet in real life. It is a culture changer, not a fad. Because of this new paradigm shift, we are now used to a global, online community. If you have a one to one conversation about an issue, only the person you are talking to benefits from the information you deliver. But if you share that information using social media, there is the potential to reach millions of other growers asking the same questions or facing similar problems. So, interacting on social media allows you to develop a community and share your story in a way that was never possible before now. Agriculture and social media has attuned together. Social media is the platform of engagement and agriculture is the content. The marriage of agriculture and social media likely conjures up images of crop seeding on Farmville, but socially savvy agribusinesses are proving that the connection runs much and much deeper than the popular Zynga game. While making a single click of a mouse, a farmer in Kathmandu can upload and share pictures of maize planting practices to thousands of followers worldwide. Then a farmer from another corner of world can make a comment on that picture and ask why that farmer planted his crops that way? Over a period discussion breaks out, growing knowledge is traded and each farmer leaves with knowledge that will help him plant a better crop in next time. Meanwhile, thousands of agriculture students across the world are watching this conversation unfold and are learning from both of these farmers. Facebook is great for connecting with people; it has more than 900 million active users. You can post updates about activity on your farm, share pictures, and see what friends, organizations, and groups are up to. Facebook is a great place to start a positive conversation about agriculture, connect with the younger generation, and get people excited about farming. Twitter is a micro blogging service option that allows you to 140 character updates and connects with people from around the world. In fact, twitter has its own ecosystem and economy, twitterverse. You can share news links, pictures from your farm. It allows you to connect with people who you have never met but share like-minded interests. Linkedin is geared toward the professional community. It allows you to network with work colleagues and is a powerful for brands and job seekers. It can be used to spread positive messages of agriculture through group forums. It is a great way to connect with like-minded people and start deeper conversations about animal agriculture. Pinterest is currently the fastest growing social media platform. It is an online pinboard where users share pictures, interests, and hobbies. It is a great tool to share pictures from the farm, your favorite agriculture fact, etc. and it focuses on visual sharing. YouTube is another visual social media tool that is user- friendly and reaches a large population. Video can be a very powerful tool for agribusinesses of any size, but YouTube‘s free-to-use model, ease of use and mass market audience means it’s a great channel for small agribusinesses. Blogging can communicate positive messages about agriculture through longer posts. Visitors want to be entertained visually. Adding images to your content will certainly make a difference in the experience of your audience where consistency is the key in blogging. There are many other popular forms of social media like Google Maps and Google Earth help you to plot your land, Flicker albums take your farm and allow it to be dynamic, etc. In order to continue utilizing advanced technologies in the field, agriculturalists will first need to harness the power of social media technology. The impact of that technology will be huge, and I am excited to see just how powerful this technology can be for agriculture. The Young Innovators Competition 2013 is looking for young people aged between 18 and 26 years with an inspirational ICT-based solution to developmental challenges. Ten winning finalists will be selected to attend ITU Telecom World 2013 in Bangkok, taking part in workshops, pitching sessions, mentoring and networking, plus receiving seed funding of up to USD 10,000 per project. ITU Telecom World 2013 is the leading platform for the global ICT community. High-level debate, knowledge-sharing and networking. The essentials to drive industry success and address critical world socio-economic challenges. The one conversation that matters, with the people that matter, with the power to make a real difference in the world. The ITU Telecom World 2013 will be held from 19 to 22 November 2013 in Bangkok, Thailand. Deadline for applications: June 30th, 2013 at 24:00 GMT+2. The South Asian Network for Development and Environmental Economics (SANDEE) is a regional network that provides research support to South Asian researchers and institutions interested in the inter-connection among development, natural resource use and the environment. SANDEE is currently inviting research concept notes on the Economics of Natural Resource Use and Environmental Change in South Asia. Concept notes, if accepted, will lead to an invitation to submit a full research proposal. Link for Uploading the Concept Note: http://www.sandeeonline.org/research_workshop_application_form.php. 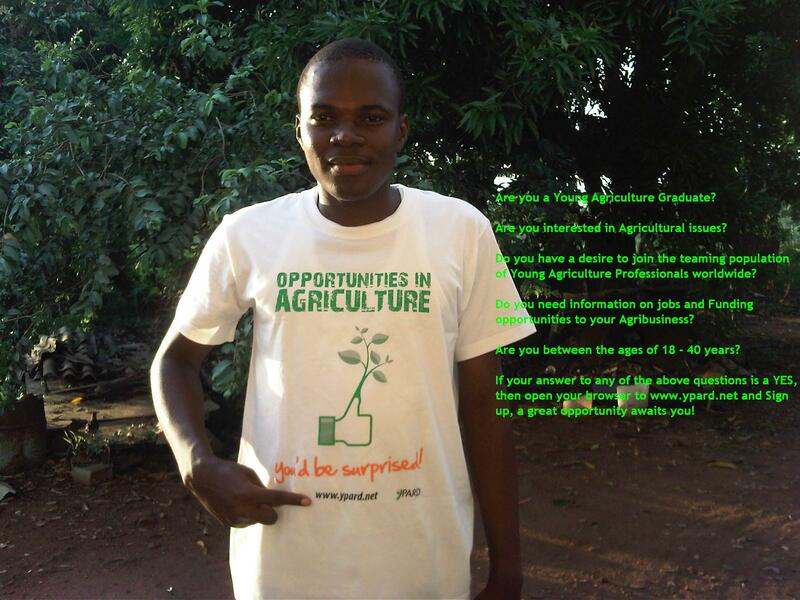 Are you a Young Agriculture Graduate? Are you interested in Agricultural issues? Do you have a desire to join the teaming population of Young Agriculture Professionals worldwide? Do you need information on jobs and Funding opportunities to your Agribusiness? Do you blog on Agriculture and Agricultural related issues or write articles or reports related to Agriculture? Do you doubt that there is money in Agriculture? Are you between the ages of 18 – 40 years? If your answer to any of the above questions is a YES, then Sign up on YPARD, a great opportunity awaits you! Swiss Forum for International Agricultural Research (SFIAR) annually awards a prize to scientists working at or in association with a Swiss institution in agricultural research for development. The SFIAR Award 2013 is CHF 10 thousand for the best team project, and CHF 1 thousand for the best master’s thesis. The Swiss Forum for International Agricultural Research offers an annual Award for scientists working for a Swiss institution in agricultural research for development. With this award the SFIAR aims to support relevant agricultural research for development (ARD) and to promote knowledge on and visibility of Swiss ARD. The thematic scope of the Award is broad. The SFIAR intends to award new, innovative and result oriented research carried out at a Swiss institution. The SFIAR Award 2013 is restricted to team projects and amounts to CHF 10’000. In addition the best Master thesis project will be awarded with CHF 1’000. For details on scope, eligibility and application see the SFIAR Award Guidelines. JIRCAS makes awards of US$5 thousand each for up to three young agricultural researchers in developing countries who contribute to outstanding research and development in agriculture, forestry, fisheries and related themes. Candidates need to be younger than age 40. The deadline for applications is 14 June 2013. AVRDC – The World Vegetable Center’s 32nd International Vegetable Training Course aims to enhance technical, scientific and managerial skills of the participants to contribute to sustainable development of their countries through increased production and consumption of health-promoting vegetables. The training emphasizes advanced and sustainable vegetable production and postharvest technologies, farmer education, marketing, and human health and nutrition. In addition, the training will enhance awareness and understanding of emerging global development issues and technologies. How to feed a population of 9.3 billion in 2050 and the staggering growth in demand for animal protein proved to be the main questions on the fourth Global Feed & Food Congress (GFFC), opened this week in Sun City, South Africa. Related topics were sustainability, science, nutrition, hygiene and latest developments in all sectors attracted 650 delegates from all around the world to the resort town in South Africa. The three day conference is organised by the International Feed Industry Federation (IFIF), with technical support from the Food and Agriculture Organization of the United Nations (FAO) and hosted by the Animal Feed Manufacturers Association of South Africa (AFMA). The programme is paying special attention to Africa, the continent with the biggest growth potential in the feed and animal sectors. All key note speakers said they were confident the industry will be able to feed an extra 2.3 billion people worldwide. Attached to production growth through efficiency and science, fair and free trade, better distribution of the available food, investment by governments in agriculture and all, social aspects should play an important role according to many speakers. “All our efforts for a safe and sufficient food supply, fair and free trade, will not be sustainable without tackling unemployment. We must make sure we are not contributing to the problem [by being inefficient]”, said Loutjie Dunn, chairman of the Animal Feed Manufacturers Association of South Africa (AFMA). A recent article on the website of the US Department of State shows how the Feed the Future Initiative, led by USAID, supports smallholder farmers and empowers women. The article details the case of the COOPAVI women’s fishing cooperative in western Rwanda and how a grant through Feed the Future (FTF) allowed the cooperative to receive training, buy motorboats and fishing supplies, substantitally increase income, and even donate 10 percent of its profits to a local orphanage and hospital. The article also mentions the Women’s Empowerment in Agriculture Index that was developed as part of the FTF Initiative, as well as highlights other examples of support given to women, including training for female rice farmers in Ghana and training for women in the field of agricultural research.